We’d love your help. Let us know what’s wrong with this preview of Black Bird Yellow Sun by Steve Light. As a solitary black bird wings its way through the day, little ones are treated to a magnificent flight from one vibrant color to another. Inimitable illustrator Steve Light showcases a new style in this board book for the youngest readers. Children can journey with the graceful bl From the creator of Have You Seen My Dragon? comes an exploration of color that truly soars. To ask other readers questions about Black Bird Yellow Sun, please sign up. Dr. Seuss took on the challenge to write a story in fifty words, and the result was Green Eggs and Ham. Steve Light takes on that challenge and does Seuss one better: he writes a complete story with a beginning, middle, and end, using only eighteen words. It's a perfect compact board book, with a compact story plus early color concepts. I wonder how many children could learn to read if they only had this book? beautiful color contrast of the black bird on the page. kids will enjoy spotting the little orange worm in each spread. though i wonder if little kids might be confused by the blue moon. No matter the amount of planning given to a story time for the youngest of gals and guys, it is always infinitely better than imagined. Their responses are genuine and straight from the heart using all their senses without reservation. The spontaneity of these children is a never-ending source of delight. For them the world, even on a cloudy day, is bright with possibilities. Black Bird Yellow Sun (Candlewick Press, March 6, 2018) written and illustrated by Steve Light invites us to take an avian No matter the amount of planning given to a story time for the youngest of gals and guys, it is always infinitely better than imagined. Their responses are genuine and straight from the heart using all their senses without reservation. The spontaneity of these children is a never-ending source of delight. For them the world, even on a cloudy day, is bright with possibilities. Black Bird Yellow Sun (Candlewick Press, March 6, 2018) written and illustrated by Steve Light invites us to take an avian day trip. We perch, glide and walk from one colorful experience to the next. I’m lukewarm about this. I might redo this review once I read other reviews but perhaps my expectations were set too high by all the ecstatic comments I read before buying and then reading. It is a perfectly nice book. I just don’t see why people consider this exceptional for the board book genre. Maybe I’ll reread tomorrow when not tired and will appreciate more. Tonight my reaction is meh. A bright, simple introduction to colors for the very young. I like the contrast of the black bird throughout. At first glance, one might find this little board book stark and unappealing and think that something more detailed and riddled with true-to-life illustrations more fitting for a young child. However, after getting into the pages of the book, the simple theme of a black bird (yes, a real black bird and drawn with simple lines in stark black) traipsing through the green grass, on the purple grapes, and through the orange leaves I changed my mind. In Black Bird Yellow Bird the young child has a so At first glance, one might find this little board book stark and unappealing and think that something more detailed and riddled with true-to-life illustrations more fitting for a young child. However, after getting into the pages of the book, the simple theme of a black bird (yes, a real black bird and drawn with simple lines in stark black) traipsing through the green grass, on the purple grapes, and through the orange leaves I changed my mind. In Black Bird Yellow Bird the young child has a somewhat innovative way to learn his or her colors. The colors are strong - especially the stark black, and there is a lot of the specified color on the page. I love the little orange worm that creeps along on each and every page. Little ones will love finding the little critter. A different sort of book, but truly good and worth considering for home or library. Thanks, Candlewick, for the advanced copy. It's a beginning-to-learn-colors book for toddlers, showing our joyful and colorful world. In contrast to a Black Bird. Steve Light's bold and bright illustrations travel from morning "yellow sun" through midday "green grass" to night's "blue moon". It's a great book to learn about colors and a few things in the natural world. Simple board book that teaches color through nature. I was able to get a free copy at BookCon 2018, for a friend with a toddler and Steve signed it for me too. I thought the art work was really beautiful and this would be a great way to teach colors and more. Black Bird Yellow Sun by Steve Light. BOARD BOOK. Candlewick Press, 2018. $7.99. Follow Black Bird along as he explores different colors, shapes, and other animals in the landscape. Bright and colorful illustrations along with giant font make this book great for learning colors and words, and finding the work on each page will be a fun activity for children. 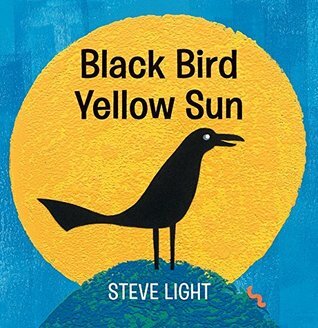 Great for babies and young toddlers, but probably wouldn’t hold the interes Black Bird Yellow Sun by Steve Light. BOARD BOOK. Candlewick Press, 2018. $7.99. Bright and colorful illustrations along with giant font make this book great for learning colors and words, and finding the work on each page will be a fun activity for children. Great for babies and young toddlers, but probably wouldn’t hold the interest of kids much older than that. The back of the book reads "From morning's yellow sun to evening's blue moon, Black Bird discovers the colors of the day. "........and that's really all that can be said about it. It is great for early literacy in that you can talk about the colors on each page. It's also a great beginning reader as there are approximately 16 words in the entire book. And the illustrations are interesting with apparent paint splotches and paper cutouts. But it's kind of dull to read. Did not love it at all. It's The back of the book reads "From morning's yellow sun to evening's blue moon, Black Bird discovers the colors of the day. "........and that's really all that can be said about it. With its simple premise of comparing colours to the base, repeating black bird, Light's board book is just right for helping babies grow an awareness of this concept. Each spread has the same format; "Black bird...yellow sun" says the first with a solid-coloured bird atop a textured yellow sun that really makes the necessary elements pop. From there, a short narrative about the bird's day unfolds, as it flies, eats, and even avoids danger, until finally it rests for the night. This is a very good book for early readers, it only has two words on each page. This book has no story line, conflict, or resolution. The black bird is the only main character in this book. The pictures going along with the black bird clearly show what the other words are. Also, all of the other things going along with the black bird go along with nature and things that the black bird could encounter. This board book follows a black bird throughout his day. With a max of 4 words per page, there is no real storyline. The emphasis is made with re different color things the black bird encounters - red snake, green grass, blue moon, etc. The illustrations are highly textured which adds to the unique style of the book. Black Bird is on the move with different colors. Colors included in the book are yellow, orange, purple, green, red, gray, pink, and blue. Great way to introduce new colors, while keeping one piece of the "storyline" the same. There is also a little orange worm that readers can find on each page. A black bird appears on each page with a colorful item such as orange leaves, green grass and purple grapes. Text is spare, with four words per spread, “Black Bird Gray Rocks,” “Black Bird Pink Flowers.” Simple, bold illustrations demonstrate each colored item as the black bird interacts with it. In a playful touch, a little orange worm waits to be discovered on each page. Elegant simplicity. It's a board book for small children and it's a good book to use to teach them about color. It's simple and a very short read with four words on each page. The black bird is on every page but with a different color background. Not your average color concept book, this contrasts a black bird against the bold colors of nature as depicted in Steve Light's gorgeous, textured artwork. As a bonus, my 6-month-old really responded to the illustrations. A beautifully simple colors board book! Steve Light follows a black bird through the day, going through orange leaves, purple grapes and more. A gorgeous look at colors, with beautiful art. A basic concepts book on colors with an underlying black bird. Simple book with lovely colors and as in the title a black bird. We've checked this out from the library several times. It is delightful. What a charming little board book. Simple, clean illustrations. Short. Perfect for a little reader. A very simple concept book executed artistically with contrasting colors, movement, shape, and whimsy. Steve Light grew up in an enchanted place known as New Jersey. He went on to study Illustration at Pratt Institute, he also studied with Dave Passalacqua. Upon graduating he did some corporate illustrations for companies such as: AT&T, Sony Films, and the New York Times Book Review. Steve Light then went on to design buttons that were acquired by the Cooper-Hewitt Design Museum. He has since p Steve Light grew up in an enchanted place known as New Jersey. He went on to study Illustration at Pratt Institute, he also studied with Dave Passalacqua. Upon graduating he did some corporate illustrations for companies such as: AT&T, Sony Films, and the New York Times Book Review. Steve Light then went on to design buttons that were acquired by the Cooper-Hewitt Design Museum. He has since published several children’s books with various publishers. He has read and told stories all over including The Eric Carle Museum of Picture Book Art and The Milwaukee Museum of Art.